While it doesn’t substitute for a continuation of the live-action films, the animated series Star Wars: The Clone Wars offers a fun way to explore aspects of the franchise’s universe. 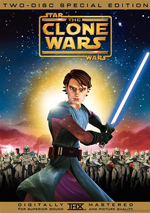 Lucasfilm launched the new cartoon with 2008’s theatrical release of The Clone Wars, but that flick was never intended to be a one-shot stand-alone affair. 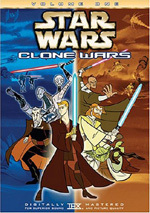 Instead, the movie acted as the introduction to the Clone Wars TV series. 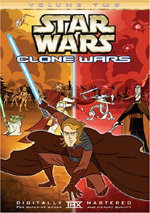 The animated show follows the same characters and time frame seen in the flick, as it looks at the period between Attack of the Clones and Revenge of the Sith. Entitled A Galaxy Divided, this DVD release offers the first four episodes of the series’ initial season. I’ll look at them in the order broadcast. The plot synopses come straight from the official Star Wars website. For all the faults of the Prequel Trilogy, I like the fact that they showed Yoda in action. In the Original Trilogy, we didn’t even meet him until halfway through the second film, and he died during the third flick’s second act. This meant the OT never let us see Yoda in action; we heard a lot about his Mad Skillz but never saw them. At least the PT let us check out Yoda in his prime, and that’s a key part of this episode’s appeal. “Ambush” comes free from much plot; the story exists to put Yoda and his three troopers in the midst of many challenging battle scenes. Within that basic framework, it offers a lot of fun. It’s a blast to see Yoda work his way through the situations, and we get plenty of good action in this delightful episode. “Rising” leads me to another aspect of the Clone series that I like: it lets us get to know more about minor Star Wars characters. I always referred to these as “Action Figure Fodder”, for without the massive number of Star Wars toys on the market, no one would know their names. Plo Koon falls into that category; he was “blink and you’ll miss him” material in the feature films. That makes it fun to see more about him and get a sense of him as a unique character. Plo Koon’s story meshes well with more of the Anakin/Ahsoka relationship to turn this into another enjoyable show. As an episode, “Shadow” essentially acts as a reworking of the climax to Star Wars. A team of fighters take on a powerful weapon to keep it from killing innocents; it’s not a literal rehash of the original film’s ending, but it’s in the same ballpark. Despite that derivative side, “Shadow” provides good action and excitement. It also acts as a nice lead-in to the final chapter of this three-part story. Funny – while “Shadow” recreates the third act of Star Wars, “Destroy” reprises the middle of that flick. We see Luke/Anakin and Obi-Wan/Obi-Wan as they try to rescue Leia/ Padmé. Again, “Destroy” doesn’t provide an explicit recreation of the bits from Star Wars, but it does fall in the same ballpark. The big difference comes from the climactic nature of “Destroy”. This gives the episode a grandness that makes it interesting, as the show concludes a major arc in the Clone Wars universe. It comes with more of the same fine action found in the disc’s other episodes, so expect an entertaining program. 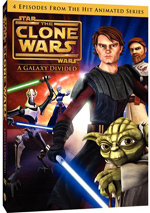 Star Wars: The Clone Wars – A Galaxy Divided appears in an aspect ratio of approximately 1.78:1 on this single-sided, double-layered DVD; the image has NOT been enhanced for 16X9 televisions. That was a serious negative right there; in 2009, no show should lack anamorphic enhancement. If those with 16X9 TVs can get past the reduced size of the image, though, it looked pretty good. Due to the reduced resolution, sharpness took a bit of a hit. Close-ups looked fine, but wider shots tended to be a little ill-defined. The shows didn’t suffer from poor delineation, but they lacked the clarity they’d have offered with 16X9 enhancement. To my surprise, I noticed no issues with jagged edges or shimmering; usually those appear with non-enhanced presentations, but they remained absent here. I also witnessed no edge enhancement, and source flaws failed to appear. With a wide range of exotic settings and characters, Clone Wars featured a broad palette that looked great. The movie’s colors leapt off the screen, as they offered excellent vivacity and impact. Blacks were concise and dark, and shadows seemed clear and well-defined. I automatically subtracted some points because the transfer lacked 16X9 enhancement, and that’s a major sin in this day and age, but I still found the presentation to appear quite attractive. On the other hand, I felt that the Dolby Digital 5.1 audio of A Galaxy Divided worked better than expected given the DVD’s televised roots. While I anticipate excellent sound from theatrical releases, weekly TV programs don’t get the same treatment. And Divided didn’t live up to the quality of its theatrical peer, but it seemed more than satisfactory for something originally aired on cable. The audio created a pretty good sense of environment and utilized all five channels in a satisfying way. As one might expect, the many battle sequences worked the track the most. These continued to display a focus on the front, where elements moved smoothly across the spectrum. The surrounds added good information throughout the flick; they weren’t “feature film quality”, but they used the channels well and added to the experience. Audio quality satisfied. Speech always remained natural and concise, and the lines meshed well with the action. Music showed reasonable life and vivacity. Effects came across as full and accurate. Low-end response was deep and tight, so expect some solid bass. All of this made Divided a solid “B+” soundtrack. Absolutely no extras appear here. We don’t even find the usual promos at the start of the disc; this sucker comes completely free from any form of bonus content. The animated Clone Wars series doesn’t live up to the best of the Star Wars universe, but it offers plenty of its own charms. As represented on this four-episode DVD, we get a lot of fun action and adventure that makes me eager to see more of Clone Wars. The DVD provides very good audio, but visuals suffer from some fuzziness due to a lack of anamorphic enhancement, and the set gives us no supplements. I’ve heard that a full season set for Clone Wars will hit the shelves before too long, and it’ll provide supplements and whatnot. Most fans will want to wait for that package, as it should be the best way to experience the Clone Wars series; hopefully it’ll boast anamorphic enhancement as well. If you just can’t wait for the season set – or if you want a taste to determine if the bigger package is worth your while – then A Galaxy Divided merits a look. It’s not the most satisfying DVD, but I like the programming.